The Northampton Arts Council is an organization whose goal is to support and promote the arts in Northampton. Originally created as a Local Arts Lottery Council, it began its work by administering a grants program in which proceeds from a state lottery are distributed to local artists, arts groups, and public schools. 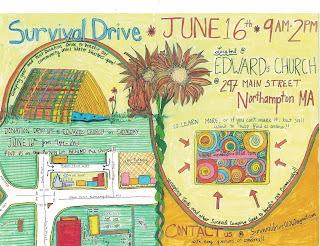 WHERE: Edwards Church 297 Main Street Northampton, MA. Next Saturday, drop off your old tents, tarps, blankets, boots, pots, lanterns, really anything that could help someone survive the Spring, Summer and Fall until the shelter re-opens. And if you don't have a garage filled with stuff like that, please consider a monetary donation. ALL funds will go directly to buying gear and distributing it to those who need it. This is a totally volunteer effort of heart to help those who have nowhere else to go. At a time when the world is seemingly more and more cold by the day, this is a small gesture that can provide someone with some comfort and coverage against the elements in a last line of defense. Thank you for reading this. Since homeless shelters are closed for the spring, summer and fall seasons, we want to give those without shelter as much of the bare-minimum-necessities that we as a community can pull together. It’s a great reason to declutter your basement, attic or trunk. It’s an even greater excuse to upgrade your gear by doing a good thing for a person whose basic survival depends on it. Have You Registered for ValleyCreates?